Porter’s crews see this firsthand. They’ll clean out an entire home, office or storage space, then turn around and haul individual pieces of furniture to the Habitat for Humanity Capital Region ReStore at 70 Fuller Road. A percentage of the hauling fee is also donated to the nonprofit. In an effort to be as eco-friendly as possible and avoid trips to the landfill, 80 percent of materials collected are recycled. This entry was posted in Junk King Reviews, junk removal and tagged Albany Times Union, Charity, Junk King on February 25, 2016 by Todd Porter. Last updated August 16, 2017 . In six years, the Rapp Road landfill that services most of Albany will reach its full capacity. That means that all garbage collected beyond that point will either have to be recycled or shipped somewhere else. Those potential shipping costs are what the local legislators are worrying about. They’re considering a “pay-as-you-throw” system. The more you toss out, the more you’ll be charged. Think of it as a power bill for your trashcan. 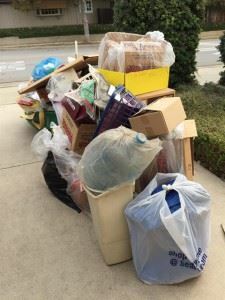 Apartment buildings are already being hit with a $180 per unit trash collection charge. All of this means you need to find a better way to handle your garbage overflow. That is a job that is tailor-made for Junk King Albany. Junk King Albany is part of a national chain of professional junk haulers. Although their service is not free, it isn’t unreasonable. Junk King’s pricing policies are based on volume. It all comes down to how much space your junk is going to fill on the back of the truck. This isn’t a “by the pound” price. That would be way out of control. Instead, the flat fee that Junk King charges includes all the labor, the transportation and those dumping charges. One of the ways that Junk King is able to keep their prices so low is because they avoid going to the landfill. Any time a truck rolls up to Rapp Road they’re going to be weighed and hit with a big dumping fee. Instead, Junk King prefers to drop off its collected garbage overflow to recycling centers or charities. If you’re done with your old sofa, that doesn’t mean it can be reused by someone else. This is the kind of eco-friendly disposal policy that might just help Albany’s landfill squeeze out a few more months of use. Your junk removal session will be completed by two very competent movers. This is the crew that is going to make sure you don’t strain your back. It doesn’t matter where you might be keeping your junk. The Junk King crew will gladly climbs stairs and crawl into crawl spaces. Just think about how your home will look after all that junk is clear out. When you need to take care of your garbage overflow and junk removal, the only call to make is to Junk King Albany. 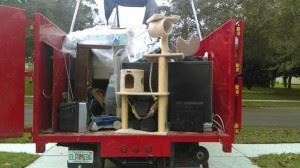 This entry was posted in junk removal and tagged junk hauling, Junk King Albany, junk removal on February 21, 2016 by Todd Porter. Last updated August 16, 2017 .